Ultrarunner Lisa Smith-Batchen from Driggs, Idaho, successfully covered the famed 135-mile route of Badwater—known as “the world’s toughest footrace” due to its extreme heat and sheer duration—four times, back-to-back, adding on two summits of the 14,505-foot Mt. Whitney twice. The “Quad Badwater” journey spanned 584 miles from the lowest point in the U.S., at -282 feet in Death Valley, California’s Badwater Basin, to the highest over two out-and-backs. 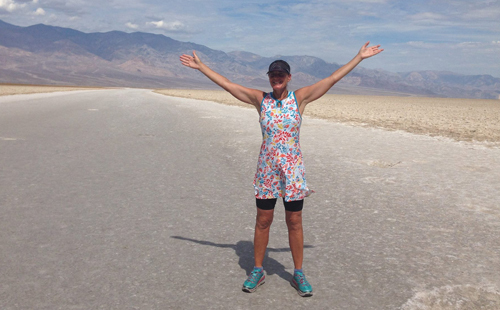 Smith-Batchen, 54, did it to raise money for an organization she created called Badwater4GoodWater, joining forces with the Waterkeepers Alliance in an effort to increase clean water around the world. Smith-Batchen, who’s finished the 135-mile Badwater event nine times, winning two, started running at 6:20 a.m. on July 1. She finished at 10:06 a.m. July 15. Adversity came in the way of 127˚ heat, as it was at the start on July 1, and frequent temperatures in the mid-120˚s. And then there were windstorms up to 50mph, sandstorms, flash flood warnings, lightning storms, obvious fatigue, severe stomach issues, and animal encounters—some real, and some imagined. Toward the end of her quest, Smith-Batchen was surrounded by packs of coyotes, with one in particular keeping a close eye on her and coming within striking distance. At about 2 a.m. one evening, Smith-Batchen sat in a chair at Panamint Springs, waiting for one of her support crew vehicles (she had six crew people) to refuel with gas. Smith-Batchen ran roughly 40 to 50 miles per day over just about 14 days. She’d rest for hours at times, but while running, she’d stop every three miles for a five-minute break. “I had in my head that every mile run would help 1,000 people. I’d do three miles and think, ‘Three thousand people. I can do this,'” she says. But with 40 miles to go, temperatures sat at 120 degrees, despite it being 7:30 p.m. The wind kicked up a sandstorm, and fear from being watched by coyotes elevated her heart rate even more than it had been. “I was just starting to get into this place of solitude, but then it turned really brutal,” she says. With 17 miles to go, lightning, thunder, and flash flood warnings amped up the fear factor, as crew members took turns sharing the final miles with Smith-Batchen. Smith-Batchen and Badwater4GoodWater raised enough money through the run to build “at least 10 wells” in Africa, where she’s helped build schools over the years.